A raw deal no more! Plenty of options, with a big ol’ punch of flavor. Crisp apple, chewy banana, crunchy kale chips. Beets and sweet potato. Every slice of dehydrated tomato packs a wallop of flavor you won’t find in a fresh slice. Try apple-cinnamon, strawberry-rhubarb leather, scrumptious pineapple-banana-coconut – you’ll never be bored. Healthy snacks on the go. So many amazing textures! Dehydrated foods are a great alternative to addictive cookies and chips. Veggie crisps for late night snacking and lean meat jerky for the hiking trip. They’re the easiest snacks in the world to pack in a handbag, backpack, or the little one’s lunch bag. No oil, no sugar, no sulfites. Lock-in nutritional value. Maintain water-soluble vitamins, minerals and enzymes. And unlike store bought food, do it without a smidgen of sugar or oil. Get your five-a-day, all year round – without breaking the bank. Dry zucchini, hot peppers, shitake mushrooms for salads. Tomatoes for omelets and pasta. Dehydrate fish and chicken for soups. Parsley, mint and coriander for seasoning. Buy your produce cheap, in season – and store it away. Save up for what matters! Keep food fresher, longer – it couldn’t be simpler. Unlike canning, you don’t need any additional equipment or expertise. Save up on last-minute trips to the grocery store for carrots, onions, potatoes or green beans. You’ll have everything you need in your pantry. Preserve the harvest. Has the apple tree in your backyard shed a bushel of fruit? Is your kitchen garden overflowing with juicy tomatoes? Store up all that fresh goodness. In so little space! Simply add some water and rehydrate when you’re ready to eat. Great for your health, better for your wallet. 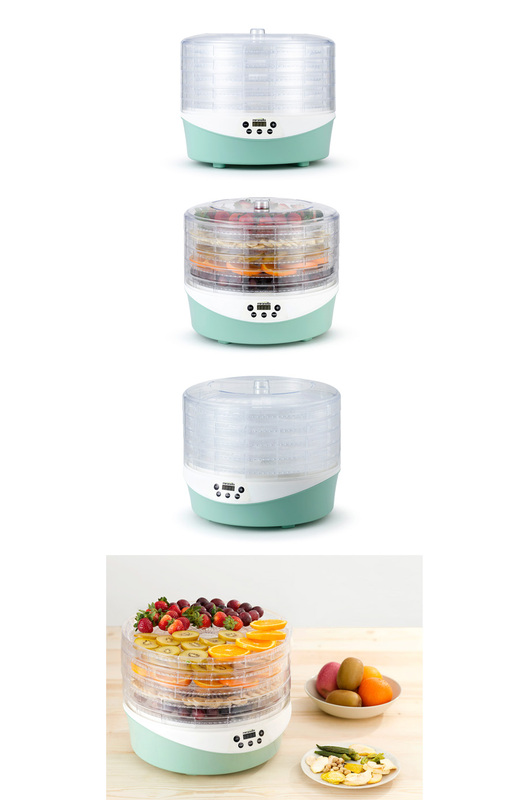 Swap your suit-busting, high-calorie treats for healthier choices with the Miranella TRU EATS Food Dehydrator. Keep a pantry-full of nutrient-dense, unprocessed foods that are filling and satisfying just a grab away. But the TRU EATS isn’t just about health or convenience. Now you can buy your produce cheap, in season – and store it for later. Simply add some water and rehydrate when you’re ready to eat. Enjoy delicious, healthy food, all-year round – without the gourmet food price!